Hura crepitans is native to the tropical regions of North and South America in the Amazon Rainforest. Locations within which Hura crepitans is naturalised include northern Australia and eastern Africa. In East Africa, Hura crepitans is invasive in parts of Tanzania (Tropical Biology Association 2010). The editors found no records of its occurrence in Kenya or Uganda, though this does not necessarily mean that it is absent from these countries. In its introduced range, Hura crepitans occurs in forest edges and gaps. 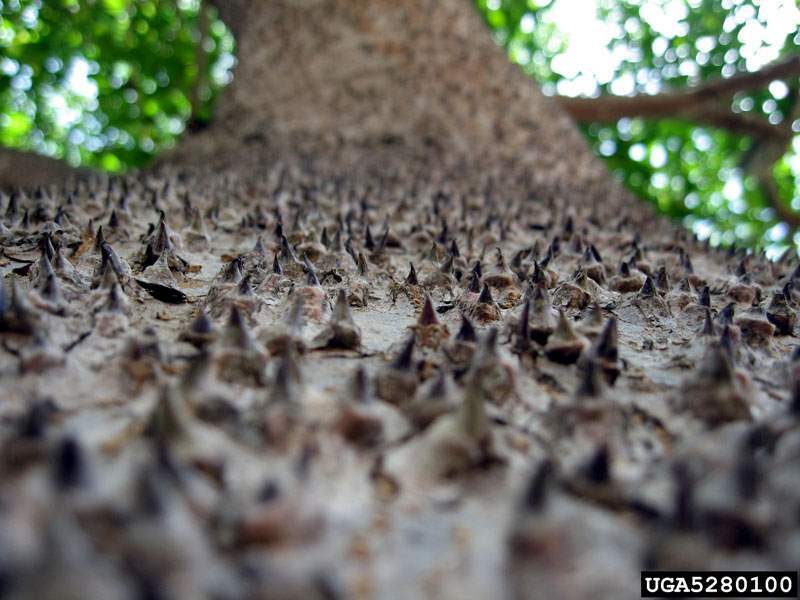 Hura crepitans is a tree growing to 40 meters high. It can be distinguished by its many dark, pointed (conical) spines. 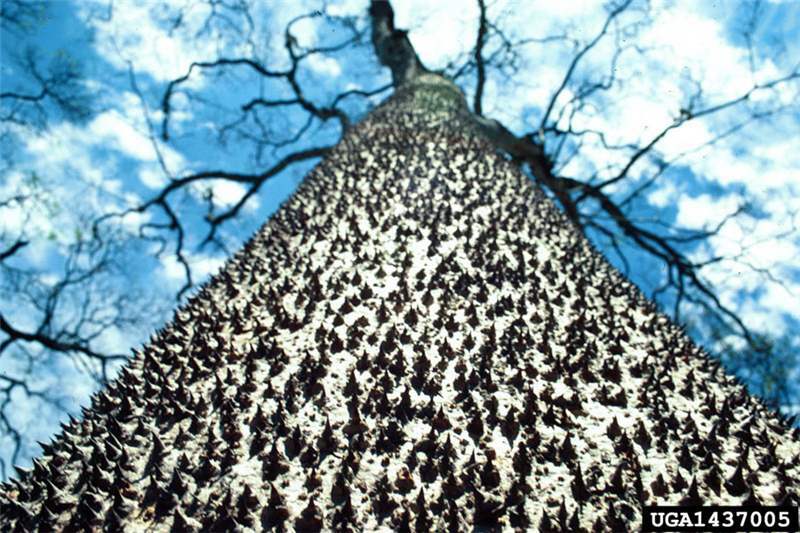 Its common name 'Monkey-no-climb is in reference to the characteristic spiny trunk. 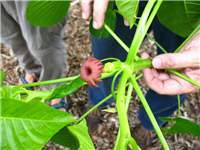 The leaves are papery thin, heart-shaped and up to 60 cm long. The berry look-alike structure is actually the male flowers that have no petals. Male flowers grow on long spikes; female flowers are solitary. 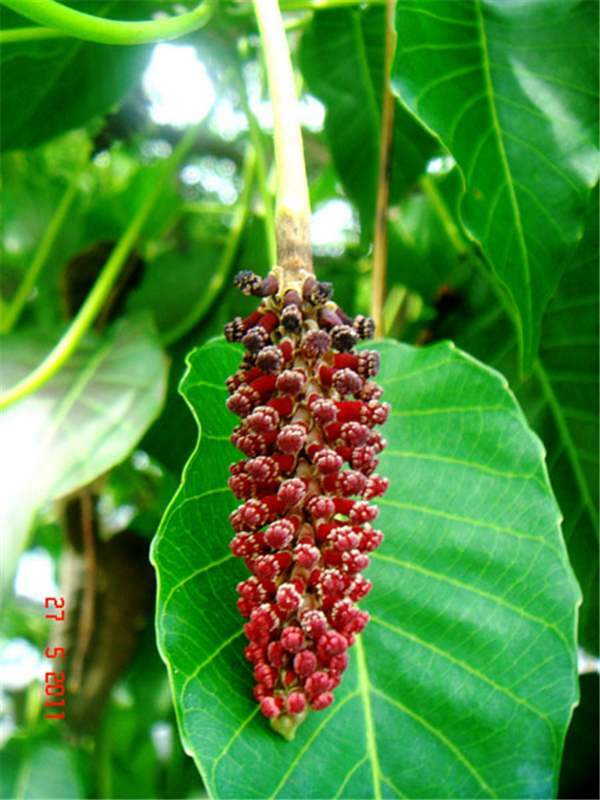 Male flowers are ovoid to conical (5 by 2 cm), mostly dark red in colour. Flower stalks (pedicels) up to 10 cm long; female flowers without pedicel; fruiting pedicel pendant to 6 cm; fruit oblate (3-5 x 8-9 cm) in diameter, reddish brown on colour, concave at the tip and base, longitudinally grooved. Fruits are pumpkin-shaped capsules, 3-5 cm in length with a diameter of 5-8 cm; it has 16 carpels arranged radially around the central axis. Seeds are flattened and about 2 cm in diameter. The fruit of Hura crepitans opens with an explosive sound into segments, hence the name 'dynamite tree'. Seeds are dispersed up to 14 metres away. Hura crepitans is cultivated for medicinal and ornamental purposes. 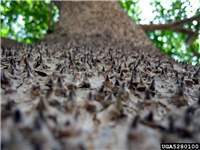 The latex is used as arrow poison and is said to cause ailing teeth to fall out. 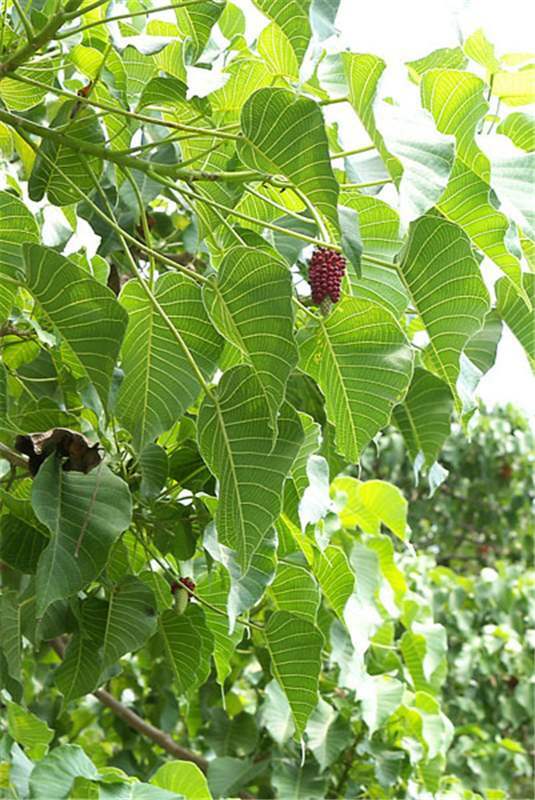 As medicine, it treats skin diseases, rheumatism, intestinal worms and has been used in the United States of America to prepare tear gas; bark extract is used to treat leprosy and wood used in light construction. 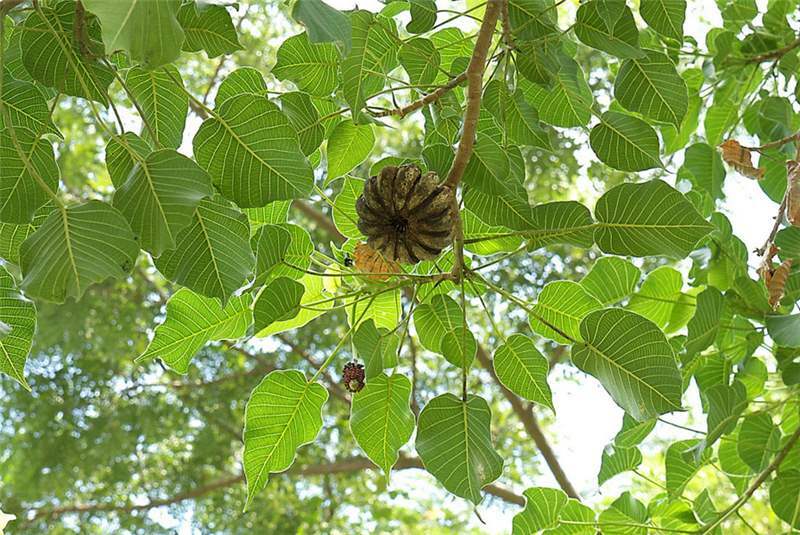 The large leaves of Hura crepitans enable the plants to grow in deep shade, allowing the plant to establish in undisturbed forest outcompete indigenous vegetation. H. crepitans is among the 14 commoner causes of plant contact dermatitis in the Dominican Republic. Tree fellers have to cover their eye since the sap causes temporary blindness. The segments of the woody fruits can cause dermatitis when they are used in bracelets and necklaces. The editors could not find any specific information on the management of this species. The pumpkin-shaped fruit of Hura crepitans was once used for holding fine dry sand used for blotting ink before the introduction of blotting paper, hence the common name 'sandbox tree'. Pacific Island Ecosystems at Risk (PIER). 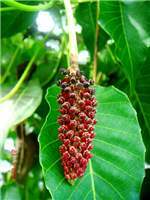 Hura crepitans: plant threats to Pacific ecosystems. Institute of Pacific Islands Forestry, Hawaii, USA.www.hear.org/pier/species/hura_crepitans.htm. Accessed March 2011. Tropical Biology Association (2010). Usambara Invasive Plants - Amani Nature Reserve - www.tropical-biology.org/research/dip/species.htm.